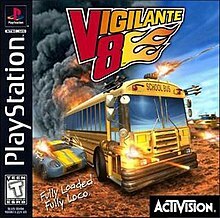 Vigilante 8 is a vehicular combat video game developed by Luxoflux and published by Activision for PlayStation, Nintendo 64 and Game Boy Color. It is a spin-off of the Interstate '76 series, featuring several of its theme concepts (auto-vigilantes, the 1970s time frame, and specific fictional vehicle companies). Players do combat over a number of stages located all over the western United States, whether in Story or Arcade Mode. Each stage has interactive features, such as ballistic missiles and launching Aurora planes for the Area 51 level. Every vehicle is equipped with a machine gun by default, but players can add up to three out of five available weapons - mines, auto-cannons, rocket pods, mortars, and homing missiles, plus a special weapon unique to the vehicle. Three types of special attacks can be made using each of the five standard weapons, at a bigger cost in ammunition, by performing fighting game-style movements and button presses on the control pad. These attacks may be performed during normal play or to eliminate nearly-destroyed cars in a method called "Totaling." In line with the fighting-game style element, players can also score up to six combo hits called Whammies. There are special icons scattered across the playing field; wrenches repair damage and yellow zigzag lines temporarily jam the opponent's homing-based weapons. Certain objectives in Story Mode must be completed to help unlock the game's secret characters and stages. The PlayStation version also offers players the option to play standard music CDs during a match. The Nintendo 64 version includes a story mode for Y The Alien and a fantasy stage called Super Dreamland 64, as well as three multiplayer modes (two vs. two, three vs. one, and deathmatch) to take advantage of the system's four control ports, and a two-player Story Mode. It also requires the Nintendo 64 Expansion Pack to improve the graphics and access bonus content. The Game Boy Color (GBC) version features five levels, each one from the console versions: Casino City, Hoover Dam, Oil Fields, Ski Resort, and Valley Farms. The game also features five game modes, each one essentially identical, with only minor changes. The game's main story mode, Road Trip, takes the player through each level. The game features three difficulty levels. The player can choose from five different weapons, as well as a unique weapon assigned to each character. The game features digitized audio and voiceovers, as well as a two-player mode made possible with the use of a Game Link Cable. Unlike the console versions, obstacles and buildings cannot be blown up in the GBC version. The game cartridge features a rumble feature. The game is set in an alternate 1975, where a global oil crisis occurs and the United States is on the verge of an economic breakdown. A rampant crime wave in the cities prompts the deployment of more security forces, leaving the hinterlands with little or no law and order. A multinational oil consortium, the Oil Monopoly Alliance Regime (OMAR), is determined to control the global petroleum market and wants the destruction of the US to ensure the success of their plan. The game's protagonists are the Vigilantes, a group of residents from various southwestern US states who band together to preserve law and order in light of the chaos gripping the country. Their leader is Convoy, an old cowboy driving a semi truck. He is accompanied in the fight by his niece Sheila, Las Vegas high-roller John Torque, alien-obsessed hippie Dave, Torque's friend Slick Clyde (whom he bullied to join the group) and FBI agent Chassey Blue, who was assigned to investigate reports of gunbattles in the region. The game's antagonists are the Coyotes, a group of hitmen recruited to carry out OMAR's scheme by terrorizing commercial installations throughout the region using weaponry stolen from the ultra-secret Site 4 base at Papoose Lake in Nevada. Their founder is known Australian terrorist Sid Burn. His cohorts are disco dancer Boogie (a close associate), mentally-disturbed S4 test pilot Loki; Beezwax, a beekeeper frustrated by the irradiation of his beehive; Houston 3, a woman brainwashed as one of OMAR's assassins, and juvenile delinquent Molo, who is driving a school bus and is desperate to join the Coyotes. An extraterrestrial being named Y The Alien appears in the game as a secret character. Each character has his or her own ending, which is part of a bigger story. Molo successfully passes the Coyotes' initiation, only to be mocked as he is made to wash Sid's car. Sid receives his payoff money from OMAR for his services, but is left stranded in the middle of nowhere because he is out of gas. John Torque finds him and stashes him in his trunk. Houston breaks free of OMAR's mind control and goes away with Convoy, who detaches the machineguns from his truck. Sheila barely misses them at a gas station and is forced to walk on the road, where Convoy and Houston pick her up. Clyde wears Houston's mind-control armband out of curiosity and emerges as the Coyotes' new leader. Chassey Blue embarks on a Hollywood career, releasing her self-titled movie based on the adventures of the Vigilantes. An alien ship abducts Dave in the middle of the night - and he beats his alien host in a round of checkers. The police arrest Boogie and he is convicted on a number of charges. Beezwax is elated at having acquired two nuclear warheads, but dies when a stray bee lands on one warhead's fuse, triggering an explosion. Loki finds a UFO and is eager to fly it, but it crashes and he is mistaken for a live alien UFO pilot. In the N64 version of the game, the ship Loki crashed is revealed to be that of Y The Alien, who was seeking extra fuel and parts for his ship after being stranded on Earth for some time looking for his friends. Vigilante 8 was developed with a team of only five people - Peter Morawiec, Adrian Stephens, David Goodrich, Jeremy Engleman, and Edward Toth. A commercial for the N64 version was produced for its release in March 1999. It shows a school bus dropping off children at school followed by game footage of the bus in combat. The students wait for their bus at dismissal time, only to find it severely damaged when it arrives. The advertisement was withdrawn following the Columbine massacre. Vigilante 8 received "favorable" reviews on all platforms except the Game Boy Color version, which received "mixed" reviews, according to the review aggregation website GameRankings. Ryan MacDonald of GameSpot noted the easy control scheme and the well-designed graphics of the PlayStation version. MacDonald noted that the game's offerings would give reason for players to "retire" from Twisted Metal 2. Shawn Smith of Electronic Gaming Monthly noted the N64 multiplayer mode offered more fun and ran relatively smoothly in high-resolution mode. A sequel was produced, titled Vigilante 8: 2nd Offense, released for the PlayStation, Dreamcast, and Nintendo 64 in 1999. A remake for the Xbox 360, titled Vigilante 8 Arcade, was created by Isopod Labs, an independent company formed by the founders of Luxoflux. The game features a high-definition rendition of the past games plus some added multiplayer levels complete with an online mode. It was released onto Xbox Live Arcade on November 5, 2008. The developer of the two Vigilante 8 games, Luxoflux, produced a game very similar to Vigilante 8 using the Star Wars license (and the Vigilante 8 game engine), titled Star Wars: Demolition. ^ a b Nelson, Randy (June 4, 1998). "Vigilante 8 (PS)". IGN. Retrieved May 7, 2017. ^ a b Schneider, Peer (March 19, 1999). "Vigilante 8 (N64)". IGN. Retrieved May 7, 2017. ^ a b c d e f Harris, Craig (January 11, 2000). "Vigilante 8 (GBC)". IGN. Retrieved May 7, 2017. ^ a b c d e "Vigilante 8 (Game Boy Color)". Nintendo. Archived from the original on April 9, 2000. ^ Marriott, Scott Alan. "Vigilante 8 (GBC) - Review". AllGame. Archived from the original on November 14, 2014. Retrieved May 7, 2017. ^ House, Michael L. "Vigilante 8 (PS) - Review". AllGame. Archived from the original on November 14, 2014. Retrieved May 7, 2017. ^ Edge staff (August 1998). "Vigilante 8 (PS)". Edge (60). ^ a b EGM staff (April 1999). "Vigilante 8 (N64)". Electronic Gaming Monthly. ^ EGM staff (1998). "Vigilante 8 (PS)". Electronic Gaming Monthly. ^ Ngo, George "Eggo" (May 21, 1998). "REVIEW for Vigilante 8 (PS)". GameFan. Archived from the original on June 13, 2000. Retrieved May 7, 2017. ^ McNamara, Andy; Anderson, Paul; Reiner, Andrew (April 15, 1999). "Vigilante 8 - Nintendo 64". Game Informer. Archived from the original on December 6, 2000. Retrieved May 7, 2017. ^ McNamara, Andy; Storm, Jon; Reiner, Andrew (July 1998). "Vigilante 8 - PlayStation". Game Informer (63). Archived from the original on September 30, 1999. Retrieved May 7, 2017. ^ Air Hendrix (1999). "Vigilante 8 Review for N64 on GamePro.com". GamePro. Archived from the original on February 9, 2005. Retrieved May 7, 2017. ^ Air Hendrix (August 1998). "Vigilante 8 Review for PlayStation on GamePro.com". GamePro. Archived from the original on January 16, 2005. Retrieved May 7, 2017. ^ Liu, Johnny (May 1999). "Vigilante 8 Review (N64)". Game Revolution. Retrieved May 7, 2017. ^ Dr. Moo (June 1998). "Vigilante 8 Review (PS)". Game Revolution. Archived from the original on June 13, 1998. Retrieved May 7, 2017. ^ Lopez, Miguel (March 10, 2000). "Vigilante 8 Review (GBC)". GameSpot. Retrieved May 7, 2017. ^ MacDonald, Ryan (March 18, 1999). "Vigilante 8 Review (N64)". GameSpot. Retrieved May 7, 2017. ^ a b MacDonald, Ryan (June 23, 1998). "Vigilante 8 Review (PS)". GameSpot. Retrieved May 7, 2017. ^ "Vigilante 8 (GBC)". Nintendo Power. 130. March 2000. ^ "Vigilante 8 (N64)". Nintendo Power. 118. March 1999. ^ "Vigilante 8". Official U.S. PlayStation Magazine. 1998. ^ a b "Vigilante 8 for Game Boy Color". GameRankings. Retrieved May 7, 2017. ^ a b "Vigilante 8 for Nintendo 64". GameRankings. Retrieved May 7, 2017. ^ a b "Vigilante 8 for PlayStation". GameRankings. Retrieved May 7, 2017. ^ Davis, Torrence (February 14, 2008). "Vigilante 8 Arcade Comes To Xbox Live Arcade". The Bitbag. Archived from the original on February 22, 2008. Retrieved May 7, 2017.